Helping younger patients enjoy bright, healthy smiles is very important to us! That’s why our team of doctors includes Dr. Geoffrey Gonzales, a pediatric dentist who specializes in caring for your special sons and daughters and providing them with the personalized, friendly care they need to feel great about visiting the dentist’s office. Please contact our Roselle Park, NJ location today to schedule appointments for the whole family! Additionally, visit the Little Smiles of Roselle Park site to learn more about our pediatric services. They emphasize the importance of caring for primary (“baby”) teeth in the early years of your child’s development, which are essential and pave the way for strong chewing habits and clear speech. They model good oral health behavior for children and stress the importance of maintaining smiles for life. They are always happy to advise parents on a variety of important topics pertaining to this, including the prevention of oral injury and disease, good dietary habits, and an ideal oral hygiene routine at home. They monitor the growth of developing tissue and teeth and will identify developmental concerns at their earliest stages, allowing for simpler corrective treatment and intervention. They help your child feel positive about dentistry! 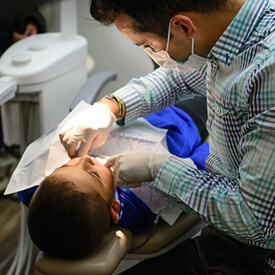 Many patients fear the dentist’s office later in life because of negative experiences as a child; our goal is to help little patients feel comfortable, entertained, and fully at ease whenever they visit.